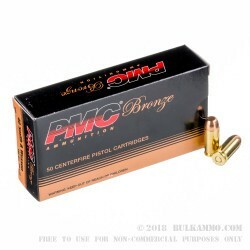 This case of .40 S&W ammo from PMC is a great way to practice with your weapon without racking up a big tab for ammo. Each case contains 1,000 rounds in 25 50-round boxes. 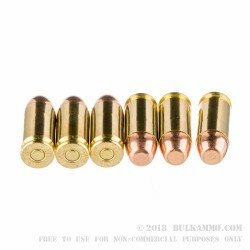 Each cartridge uses a typical 165-grain flat pointed full metal jacket bullet in a Boxer-primed reloadable brass case. When fired, the bullet achieves a muzzle velocity of approximately 989 feet per second. Manufactured by Poongsan Corporation in South Korea, PMC ammo is known for its cleanliness and consistency. Poongsan has acquired extensive experience in making large amounts of good ammo over several decades of handling ammo contracts for the South Korean military. The company's large capacity and economies of scale have allowed it to export a steady stream of ammunition to the US under the PMC brand. This was my first bulk ammo purchase and I don't regret it. I have put 600+ rounds through my H&K VP40 and I am impressed. Not a single misfire, FTF, or FTE. It cycles perfectly even on a new-ish (about 500 rounds through before the PMC) gun. I like the 165gr round since it is much easier to reacquire targets than with the 180gr I was shooting. At 5 meters the groupings are tight, and at 10 meters I am still drilling 5-inch circles with ease, accounting for obvious shooter error. The price is great compared to buying 250-round "bulk" packs at the big box store. Especially considering the reliability, accuracy, and cleanliness of this ammo. I'm still working my way though the ammo. It is said that I can buy quality ammo make in the ROK cheaper than I can ammo made in the USA. I bought some if this for a defensive pistol class. I fired 1,500 rounds through my Gen 2 Glock 23 during the class and the only "cleaning" was wiping the outside of the muzzle so it didn't get my shirt dirty when I carried it to dinner. (It's a Glock, what else would you expect… reliability wise , they're the AK-47 of pistols!!! Lol) Very accurate (could poke an empty cartridge in a hole in the paper and hit it from 10-15 yds reliably), fairly clean, NO duds, NO FTF/FTE's. I bought this ammo to use at the range to break in my new gun and my first 50 rounds I had a couple FTE's but I am blaming that on the gun being new and breaking in....I have now ran 500(ish) rounds through the gun and no FTE's or and alibis despite the couple through the first 50 rds. Bought this ammo and it was here in 3 days! All my firearms eat up PMC! BulkAmmo's customer service and prices are second to none. I'll be buying more soon! Q: Does this ammo come in a box or an ammo can? Posted On: 5/21/14 By: Packaging? A: Hello, The case of these 165gr. 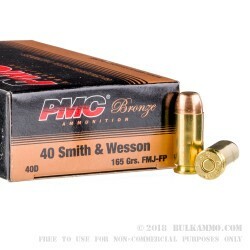 FMJ rounds in .40 S&W by PMC comes in a box with 20 boxes of 50 rounds each. These make excellent target rounds!